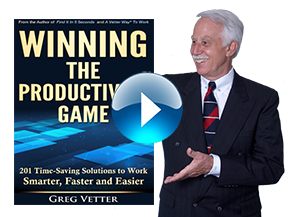 Winning The Productivity Game | Vetter Productivity, Inc.
Are you BOMBARDED with information, interruptions, and requests? 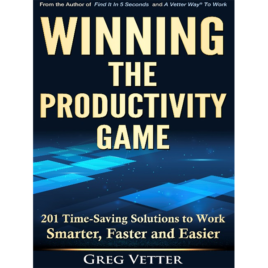 Vetter’s tips for victory in Winning the Productivity Game are succinct and easy-to-follow. Full of real-life examples, this is not your typical time management book. In a humorous and engaging style, Greg Vetter will challenge everything you think about productivity, and show why his radical approach is a game-changer. Getting and staying organized can feel like a game that is rigged against you. 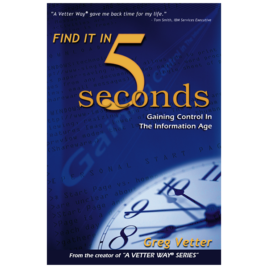 For over 25 years, Greg Vetter has helped workers in all areas learn how to process the overload of information, and how to produce critical results which lead to promotions, increased revenue, and more personal time. WITH SMALL CHANGES COME BIG RESULTS! The practices you have used to get you where you are today, are not sufficient to take you to the level you could achieve, nor will they be sufficient for you to handle the onslaught of information when it doubles in the near future. With small changes come big results—this book is for you if you are ready to quickly adopt new, simple, and proven work habits that will produce results that you’ve never before believed you could achieve. 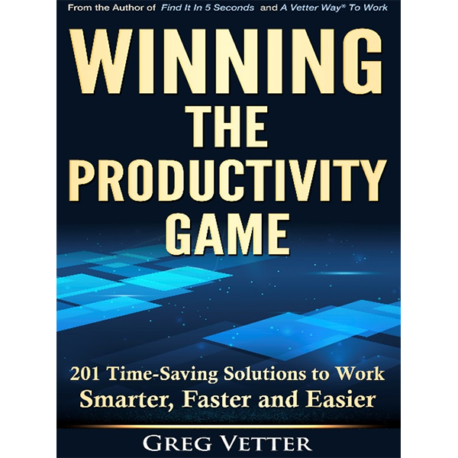 President, The Productivity Pro, Inc.
A practical, step-by-step, real life system of how to organize your workplace. How to find everything you need in seconds! Why the old Time Management theories no longer work in the Information Age. To recognize why paper clutter and disorganization are manifestations of deeper psychological issues, such as the inability to make decisions. A basic system of how to work in the office-- something that few people have been taught.